I’m a sucker for anthropomorphic dogs. And the ‘90s. And pizza. 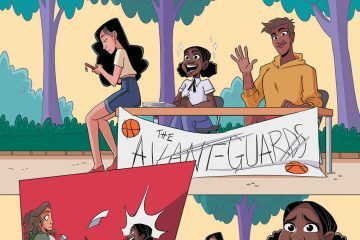 Listen: Teen Dog #1 is the cat’s pajamas top-to-bottom. Jake Lawrence has something very special going on in this trippy, throwback series, and BOOM! Studios was smart to jump on this little webseries that could and give it an 8-issue original run. Teen Dog is the story of Teen Dog, a teenaged dog who walks and talks and rocks the denim vest and hi-tops and skateboards and loves to eat. I heard “he did a kickflip over the moon.” He has a best friend named Mariella, who rocks a pink side-pony and fingerless gloves. They have a secret handshake that’s so secret they don’t even know it. It’s all super rad and super entertaining. Sometimes, when Teen Dog touches a human, that human sees “every possible future and every possible past in the blink of an eye.” Yeah, it’s a trip. And did I mention it’s rad? 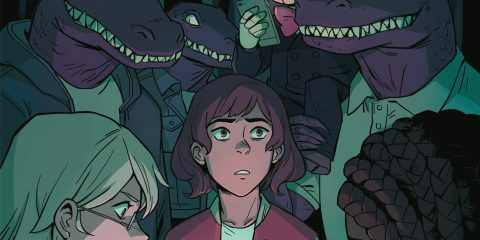 There is something wonderfully endearing and intriguing about Teen Dog #1. Jake Lawrence structures the issue as a series of vignettes, each exploring some small facet of Teen Dog’s day at Tantamount High School: meditations on cliques, pizza, and history class; interactions with the school bully Thug Pug and Sara Soto the Star Quarterback; and more pizza obviously. It’s slice-of-life, sure, but packaged in the most bizarre, fantastical premise. Aesthetically, Teen Dog draws on the classic ‘90s cartoon style. Reminiscent of Daria and Doug and Rocko’s Modern Life, Jake Lawrence’s particular brand of art is energetic and eccentric. And the colors are totally like those classic Lisa Frank folders from those ‘90s school days. Like whoa. Buy. 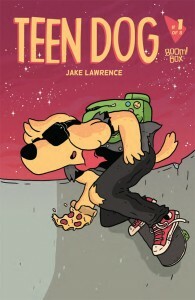 Teen Dog #1 is a throwback to those neon-blasted, simpler, spacier ‘90s, when pizza was a punchline and skateboarding places was still a thing. And I would argue that it’s All Ages – 8+ perhaps! 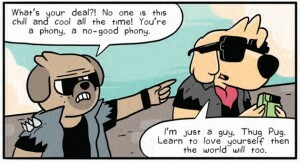 Jake Lawrence has created a delightful, wonderful universe in Teen Dog, and I’m thrilled that BOOM! is bringing it to the printed page! Check it! 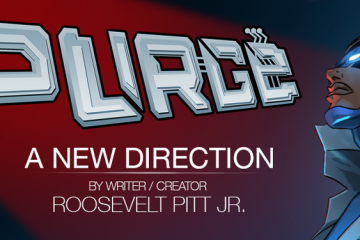 PS – Check out the original webseries at Jake Lawrence’s website!! !